Chiringa Platoon, was adjudged the overall best platoon in the 2019 Ghana Military Academy (GMA), steeplechase competition for special Medical Intake 5, in Accra. With a total point build-up of 841, Chiringa emerged champions of the competition following impressive output from officer cadets in the platoon. Burma Platoon came second with 986 points whilst Abbysina Platoon were third with a 1036 points accumulation. Officer Cadet (O/CDT) Effah K of Abbysina was named the best runner, with O/CDT Soglee P.D picking the first runner up place, whilst O/CDT Dottey S.T was rewarded, as second runner up. For her resilience, O/CDT Pianim A.A was adjudged the best female runner in the competition, which involved an eight kilometre distance running across parts of the Teshie township. Commodore Eric Adu, Flag Officer Commanding Naval Training Command (FOC NAVTRAC), speaking as the Special Guest congratulated the officer cadets for their endurance in crossing the chains of obstacles before getting to the finishing line. 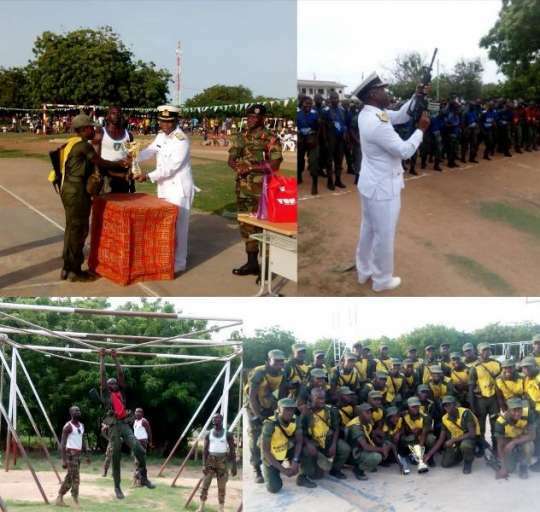 He said the competition, which served as part of the training program for GMA aimed at testing the physical fitness, endurance and obstacle crossing abilities of the officer cadets. “The competition has demonstrated the strengths, tenacity and mental fortitude of participating cadets of the special Medical Intake five, as a cadet you must be fit and competitions such as this helps to build your level of fitness,” he said. He acknowledged the Chiringa platoon for winning the competition, and noted that officers were also required to pass their basic fitness test as part of their promotion exams and all courses.